UiPath, the leading enterprise Robotic Process Automation (RPA) platform, has been recognized as a Leader in The Forrester Wave™: Robotic Process Automation, Q2 2018. Among 15 RPA vendors, UiPath achieved the highest score in the “Current Offering” category, the highest possible score in the “Market Presence” category and among the highest scores in the “Strategy” category. UiPath also received the highest possible score in the criteria of architecture, execution on enterprise RPA strategy, partnership ecosystem, product road map and differentiation, and enterprise customers. 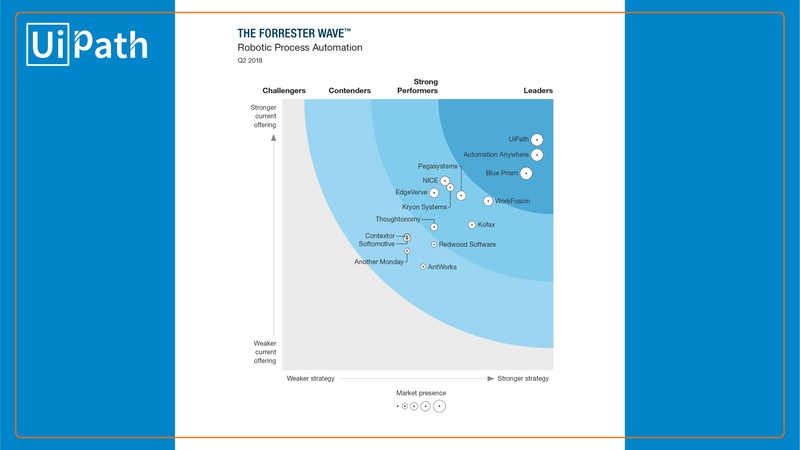 The Wave examined the rapidly maturing RPA market, which is moving so fast that features that stood out in the 2017 Forrester Wave™ are now expected. To assess and recognize the vendors driving the advancement of RPA, this year’s evaluation highlights deployment efficiency, scale, training breadth, new ways to look at governance, and advancing analytics. Participant evaluations were based on a comprehensive set of 30 evaluation criteria, grouped into three categories: Current Offering, Strategy, and Market Presence. As part of Forrester’s rigorous review process, the firm also analyzed vendor surveys, conducted customer reference surveys, participated in product demos, and examined expert interviews. The RPA market is growing extremely quickly – and for good reason. RPA has proven to be incredibly valuable when it comes to ushering in better and more efficient ways of working, and we’re seeing explosive demand for our platform from organizations around the globe. The UiPath team – and our amazing network of investors and partners – are capable of bringing about dramatic improvements to enterprise operations, and we believe our position in this year’s Forrester Wave™ proves that.